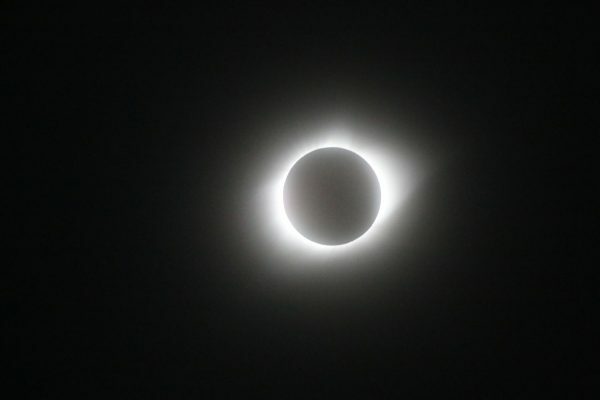 When science writer Trudy Bell said to never let anyone convince me that 99% of the sun covered was the same as totality, I didn’t know what to think. 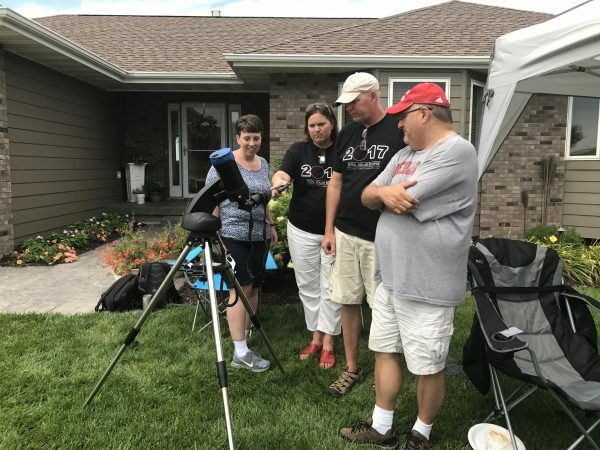 She then went on to say, “It’s 1% of the sun’s surface, but it’s 100% of the experience.” The moment the moon fully covered the sun during the recent total solar eclipse that passed over our hometown of Crete, Neb., I knew exactly what she meant. And she was right. 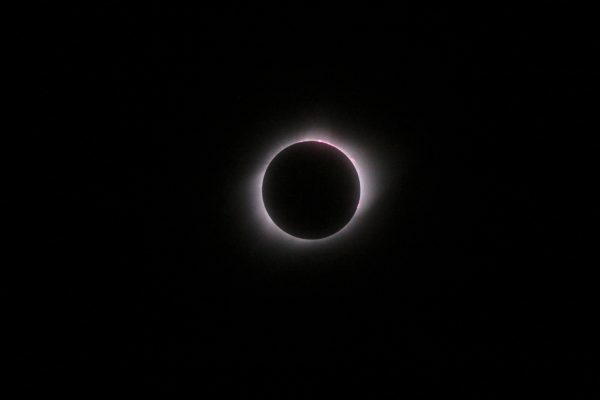 Total solar eclipse, photographed by Ronald D. Koch in Crete, Nebraska. If you look closely, you can see solar flares along the edges of the moon. Ann and I had been looking forward to the eclipse for some time, and we couldn’t wait to welcome travelers from around the nation and the world to our hometown. On the Saturday before the eclipse, we had a booth downtown where we sold t-shirts as well as souvenir postcards — something for the special stamp and cancellation mark from our local post office. 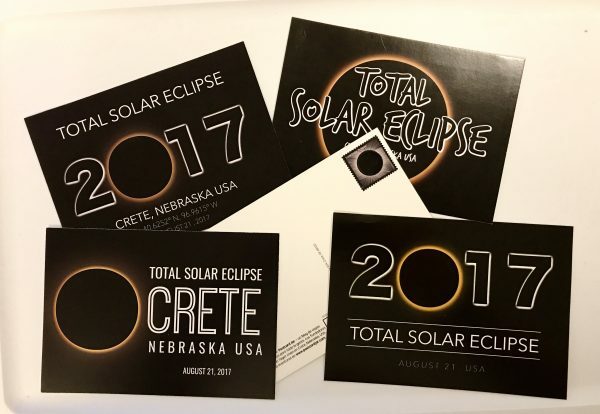 We designed five total solar eclipse postcards that we sold throughout the weekend of the eclipse. They made a great souvenir from the event. We had an absolute blast meeting people from all over the country who were in Crete for the total solar eclipse. We met and talked with people from Nebraska, Iowa, Wisconsin, Ohio, Michigan, Texas, Oregon, California and Nevada. We learned so much about eclipses from people like Trudy Bell. More eclipse fun!! This will be Trudy’s SIXTH total solar eclipse! She is a wealth of knowledge when it comes to eclipses and we’re so happy to welcome her and her daughter to Crete this weekend! 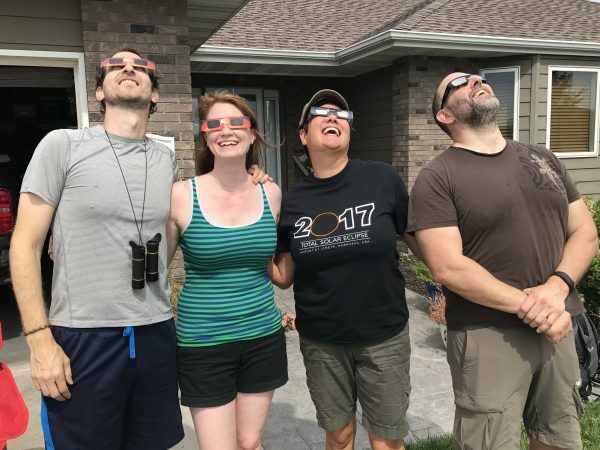 We also met people from Winnipeg, Manitoba, Canada, who were excited to be in town for the eclipse. Their description of what was to come just added to the excitement of the day. Talking eclipse in downtown Crete, Nebraska. Our little t-shirt and postcard sales gig proved to be pretty popular and we found ourselves a little busier than expected answering calls and texts from people all weekend. 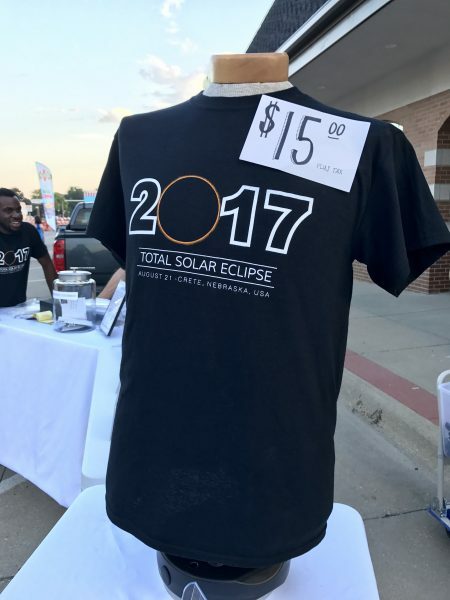 We sold several hundred of these 2017 total solar eclipse t-shirts during eclipse festivities in downtown Crete, Nebraska. By Monday morning, we were ready to be done with postcard and t-shirt sales and just settle in to watch the eclipse. But people kept contacting us. 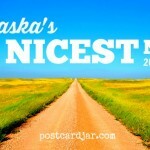 In fact, the owner of our local Ace Hardware store had some people from Iowa who really wanted some postcards so he just drove them up to our house to get some. That’s what we do in small town America. 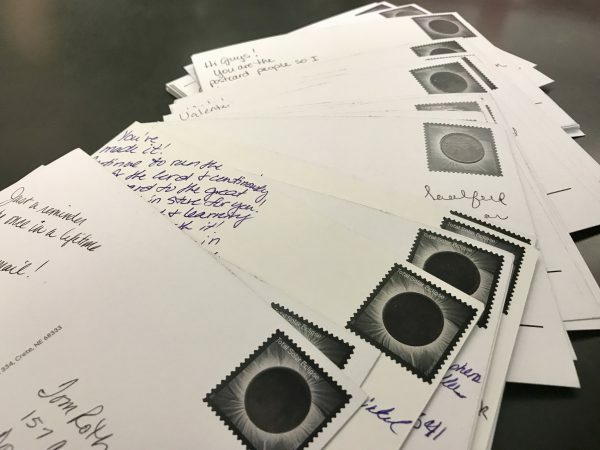 We sold more than 2,000 total solar eclipse postcards and our local post office offered a special cancellation stamp. While they were here, we got a call from friends in a local park–apparently, people were clamoring for more postcards, so we were off again, making arrangements for their sale and distribution. In the meantime, we’d met a couple other folks from Vancouver, British Columbia, Canada who wanted a t-shirt. They seemed nice, so we invited them up to our place to watch the eclipse. We met great people from all over the world, including these eclipse chasers from California, Nevada, and Canada. We were so tickled that they accepted our invitation. We also had our friends and fellow travel bloggers, Sara (and her husband, Todd) of Travel with Sara, and Lisa and Tim of The Walking Tourists, a friend of mine from college and his family, Ann’s mom and my parents, friends who were just back from Sri Lanka, a dozen or so college students and suddenly, we had a houseful. Friends and fellow travel bloggers Lisa and Tim Trudell and Sara and Todd Broers look at the eclipse through a telescope in our front yard. 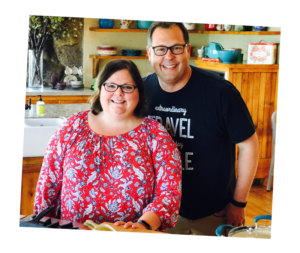 I threw some burgers on the grill, Ann and my mom made some great salads, we cooked some locally grown Behrens family sweet corn in a cooler, and lunch was served. 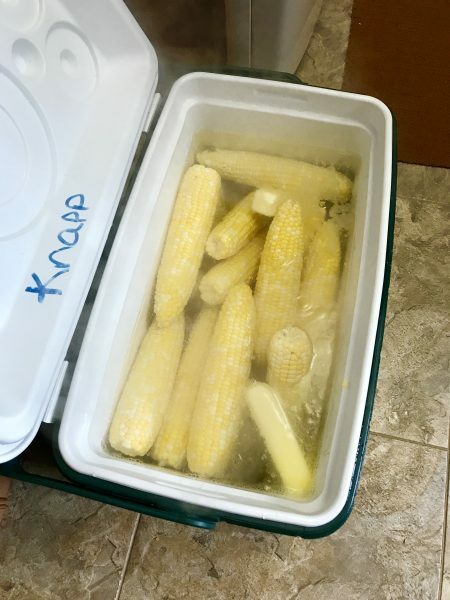 We learned a great way to make sweet corn for a crowd is to pour boiling water over the corn in a cooler and just shut the lid for about 20 minutes. Clouds were all around that morning, threatening our eclipse viewing, so I said a prayer. Still, the whole group had a lot of fun chatting and getting to know each other. 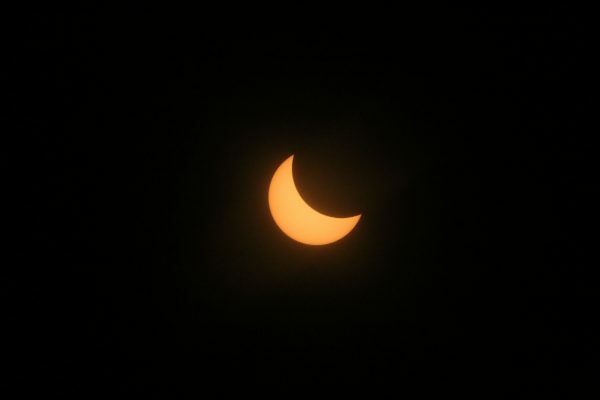 Finally, after so much anticipation, the solar eclipse began. 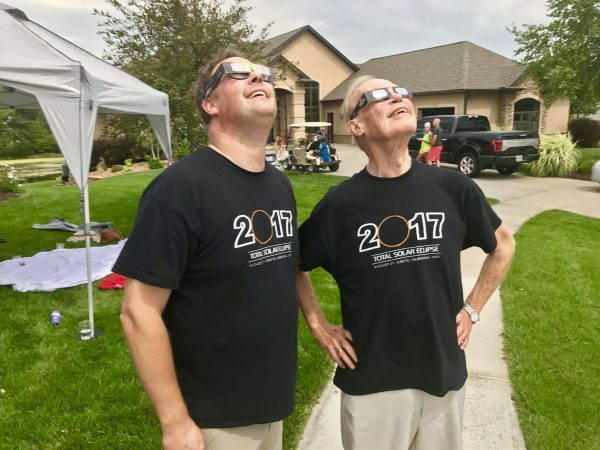 Steve and his dad, John Teget, watch the total solar eclipse from our front yard in Crete, Nebraska. We all put on our eclipse glasses and at first, we couldn’t really see any difference in the sun. Then, it became more clear. As the moon transited the sun, anticipation (and cloud formations) grew. We couldn’t wait! Thankfully, God answered my prayer and the clouds held off until just after totality ended! What follows is a series of photos of the eclipse. We’d like to thank our friend Ronald Koch who took these photos right here in Crete. 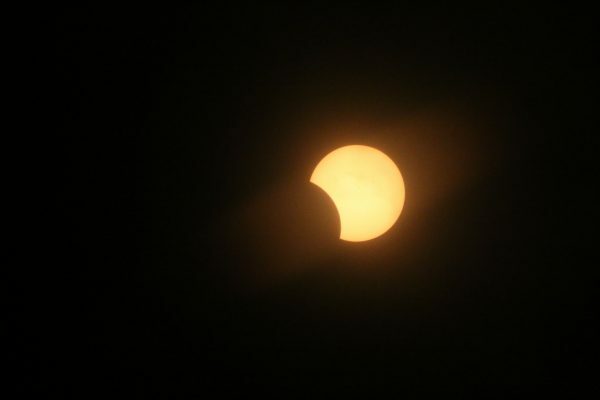 A view of the partial eclipse before totality. Photograph by Ronald D. Koch, in Crete, Nebraska. 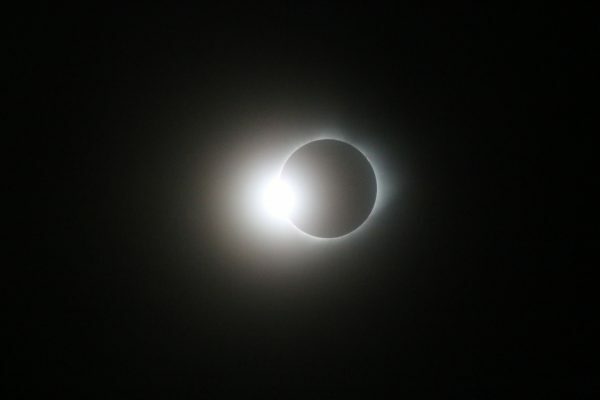 Just before the moon completely covers the sun, we could see the “diamond ring” effect. Photograph by Ronald D. Koch in Crete, Nebraska. The moon completely covers the sun during totality allowing viewers to see the sun’s light shine out around the moon. Photograph by Ronald D. Koch in Crete, Nebraska. Just a little bit of the moon still covers the sun following the total solar eclipse. Photograph by Ronald D. Koch in Crete, Nebraska. After experiencing totality, I feel confident in saying that all the positive hype we’d heard about the eclipse didn’t adequately describe it. It was a sight unlike anything I’d ever seen and I can’t find the words to describe the experience. I go back to what Trudy Bell said in the video above, that 99% covered means that 1% is uncovered. And that 1% is 100% of the experience. Seeing the sun completely covered, looking at the rays of the sun shining out around the moon, seeing a metallic, teal colored sunrise in all directions, all while hearing the crickets chirping and frogs croaking at 1 o’clock in the afternoon was an incredible experience. Ann and I had run all over town in the days and weeks leading up to the eclipse, we’d done so much to prepare. Those 2 minutes and 26 seconds of totality were worth it to us and to all those who had traveled from near and far to see it. 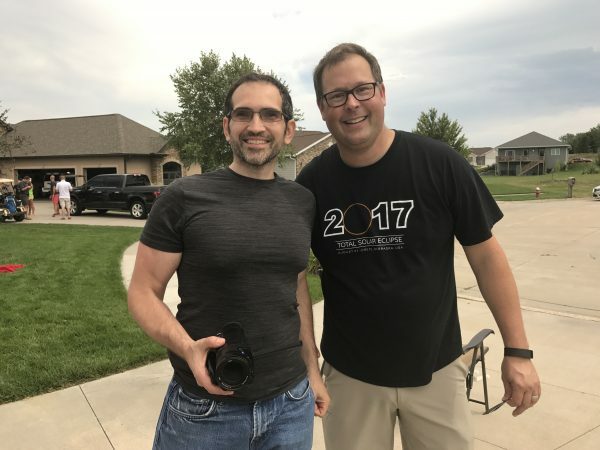 Steve’s friend, Scott drove with his family from Wisconsin to see the total solar eclipse. We wish we could have had all our blog followers in Crete for this event. We know that isn’t possible, so Ann took a video during the eclipse while on our deck. While watching video isn’t the same as being here, I hope it at least gives you an idea of what the experience was like. Listen to the cheers and the spontaneous reactions of those who saw this awesome sight. From our back yard at totality. We are now officially eclipse junkies, and are already beginning to make plans to travel to the path of totality for the next eclipse in the U.S. on April 8, 2024. That one will enter through Texas and exit through the northeast. Visit [HERE] for a map showing its path as well as the path of all the eclipses in the US between now and 2050. If you have not yet seen a total solar eclipse, you should strongly consider making plans to do so. If you do, I think you’ll find that you have a hard time finding words to describe the experience, as well. Were you able to watch the total solar eclipse? Tell us about your experience in the comments section below.